We’re fast approaching the time of the season when colonies will attempt (and manage) to swarm. Swarming is the way bees increase their colony numbers. Inevitably, because it means the loss of many of the foragers – the honey-gathering workers – beekeepers try and prevent or control swarming. Prevention is better than control, but it can be difficult or impossible to achieve. Inevitably, a very large number of swarms are therefore lost. The swarming process has been well-studied by eminent scientists like Martin Lindauer in the early 50’s and Tom Seeley more recently. The colony ‘decides’ to swarm. They rear one or more new queens in queen cells. On the 9th day after the egg is laid the cells are capped. Then or shortly afterwards the colony can be expected to swarm, with the original queen and up to half of the workers leaving with her. Swarming tends to happen on a warm, calm, sunny day (but not always). Casts may follow. The swarm leaves the hive and settles nearby, in a tree or on a fencepost. Usually this initial ‘staging post’ is a short distance (perhaps 5-20 metres) from the hive. Scout bees fly from this swarm, surveying suitable locations in the area to set up a more permanent residence. Actually, the scouts have been hard at work already. Once the swarm issues from the hive they set about persuading all the other scouts that they’ve found the ideal location. This ‘persuasion’ is the topic of the excellent book Honeybee Democracy by Tom Seeley. 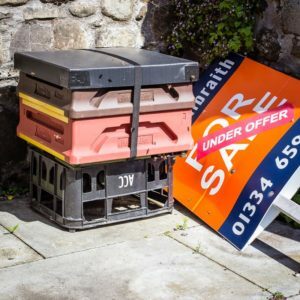 Once a consensus is reached (which might take hours or a few days) the swarm leaves its temporary staging post and flies directly to the final location … a hollow tree, the church tower or above your neighbours soffit. There they set up home. Most swarms do not survive. 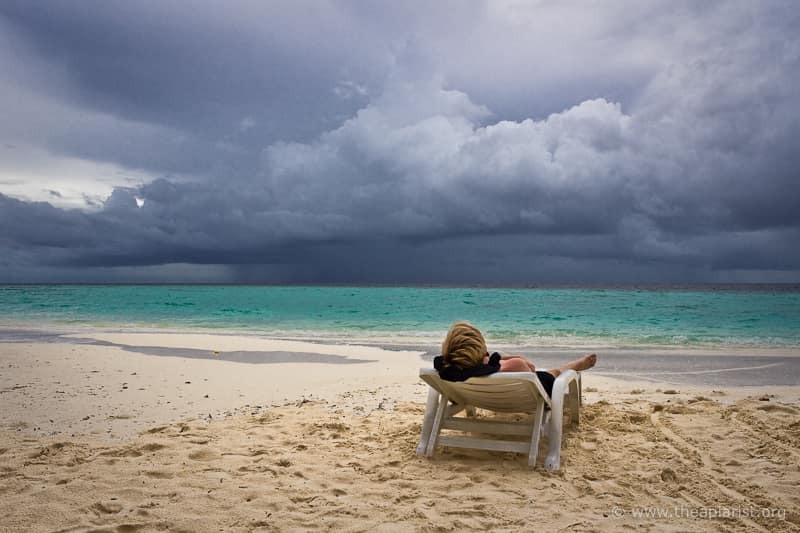 They get caught in a storm before relocating, they succumb to disease or they eventually starve to death. Since most strong colonies can – unchecked – be expected to swarm every year, the fact we’re not inundated with colonies indicates that most die. One beekeepers loss can be another beekeepers gain. Swarms can also be an annoyance to non-beekeepers. ‘Normal’ people. 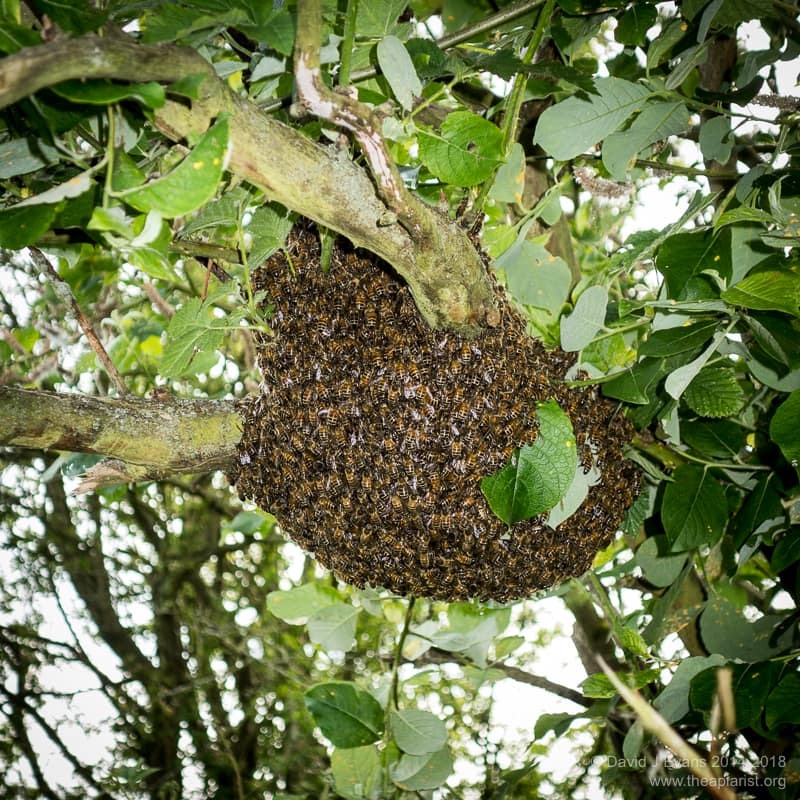 This always surprises me because a swarm is a stunning site and usually totally unthreatening and unaggressive 1. Nevertheless, they can be an irritation, both when swarming or if they become established in the church tower or a hollow tree. And, without Varroa treatment they will act as a source of disease for other colonies in the locality through robbing and drifting 2. So, rather than just let swarms disappear over the hedge or horizon, far better to capture them, put them in a hive and manage them properly 3. There are essentially two ways to achieve this. Get them when they’re at their temporary staging post, drop them into a box and subsequently hive them. I’ve discussed this process before. Alternatively, set up one or more bait hives and entice a swarm to choose this location rather than the church tower or a hollow tree. Again, I’ve discussed how to set up a bait hives several times before. Honeybee Democracy contains the definitive guide to the desirable characteristics of a bait hive. Conveniently it’s a dark box the size of a National brood box (~40 litres) with a small entrance (~12.5cm2) at the bottom. It helps a lot if it also smells of bees. This can easily be achieved by placing an old black brood frame up against one wall. Fill most or all of the rest of the box with foundationless frames 4 and place it in a suitable location. Which is – finally – what this post is all about. Seeley studied the desirable characteristics of both the bait hive and the location in which it is sited. By location I really mean height from the ground and orientation. However, he and others have also investigated how far from the original temporary staging post the swarm are prepared to fly to occupy a ‘des res’. So, once you’ve prepared your bait hive(s), the three features of the location you need to think about are their a) orientation, b) height above ground, and c) distance from your bees (or other apiaries 5). The first two are straightforward as Seeley describes in Honeybee Democracy. In the mid-70’s he conducted a series of experiments which showed that bees prefer bait hives that a) faced South and b) are located higher (5m from the ground) rather than lower (~1m) 6. Most of the studies in Honeybee Democracy use artificially prepared swarms. Seeley would place these on a post and then observe where they relocated to … essentially he was circumventing the natural process of swarming by ‘starting’ them from the staging post. Many were conducted on an island where there were limited options to relocate to … and at limited distances. These studies weren’t ideal to determine how far a swarm will relocate from its temporary staging post. 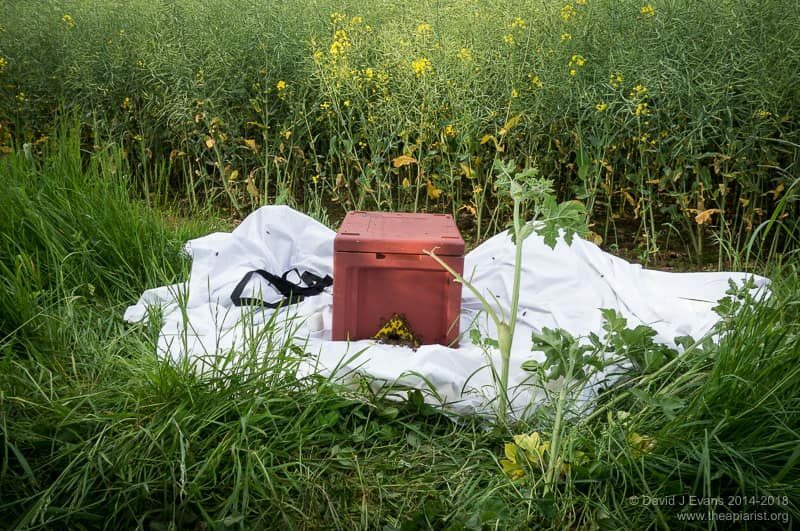 This is important in deciding whether to place bait hives in, near or distant from established hives. It might be logical to expect swarms to choose distant final destinations rather than nearby ones. For example, this might ensure less competition for forage. 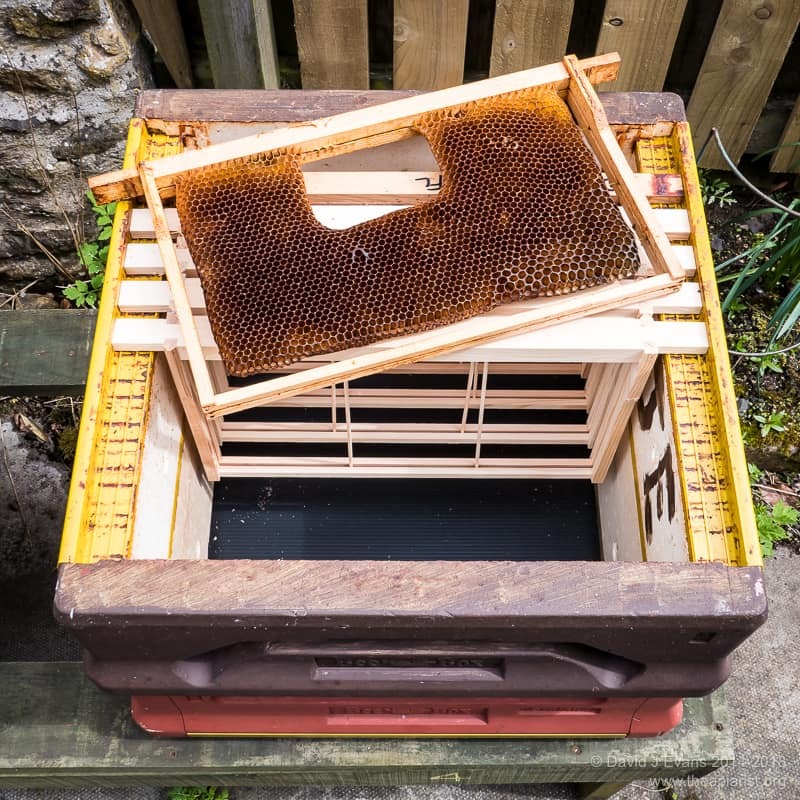 That would suggest that bait hives should be situated a long way from your own – or other – apiaries. However, it turns out that when bees multiply they usually choose not to go forth very far. Although there is some contradictory evidence, it appears as though swarms prefer to relocate to nearby sites, rather than distant ones. Seeley and Morse (1977) demonstrated that swarms chose a nearby (~20m) site rather than a distant site (~400m) 80% of the time 7. Jaycox and Parise (1981) showed that swarms always chose sites less than 200m from the artificial swarms prepared for their study 8. Schmidt (1995) demonstrated that artificial swarms chose to relocate from as little as 0.5m to at least 1 km (average ~400m, i.e. much further away than the other studies) 9. Why they prefer to set up home near to the original colony is unclear. At least one paper speculates it leaves the option to rob a genetically-related (and possibly less defensive) colony more easily. I set up bait hives every year. I’ve never failed to capture swarms. I’ve also – inadvertently – had swarms occupy stacks of stored brood boxes or supers. The entrances have faced almost every direction, with South East and South probably being the most often occupied. However, this is a biased survey … I usually use the same site that worked in previous years. Although I’ve located bait hives high up on the top of greenhouses or sheds, the majority are on normal hive stands. This is pragmatism, not because they are more attractive to the bees at knee height 10. Finally, I put them where I can see them and check them. I locate one in the corner of each apiary, as far from my other hives as possible, but probably never more than 10m away. I also always have a bait hive in the garden where I can observe it on a daily basis. It’s great to see the first scouts appear, to watch their numbers increase day upon day, to keep an eye on the weather for a hot calm day … and to try and predict when the swarm will arrive. Scout bees are not aggressive. They fly in a characteristic manner, checking the bait hive and the immediate vicinity from all directions. If the numbers of scouts builds up to dozens or hundreds and they all disappear … either they’ve chosen somewhere else or the swam has been captured. Or they’re guiding the swarm to your bait hive at that very moment. Swarming bees gorge themselves with honey before setting off – so they have stores ready to start building comb at their new destination. No one feels like picking a fight after a big dinner. Don’t believe some of the nonsense about these feral bees being an ideal source for Varroa-resistant stock. They’re not. Studies have demonstrated they have at least equivalent levels of disease as unmanaged colonies in hives, and higher levels of some viruses. It’s important to note that you probably do not know where the swarm originated from … you should therefore quarantine them, check for disease and treat for Varroa. These aren’t specified in Seeley’s book … importantly they don’t reduce the apparent volume (which the bees measure by flying around in the dark until they crash into things!) but they do provide the guides for new comb to be built. Remembering that it’s bad form to set up bait hives in the immediate vicinity of another beekeepers hives. For completeness he showed that the following features were irrelevant – shape of entrance and the shape, dryness or draftiness of the cavity. They’re really not that fussy. Seeley, T. & Morse, R. (1977) Dispersal behaviour of Honey Bee Swarms Psyche 84:199. Jaycox, E. & Parise, S. (1981) Homesite Selection by Swarms of Black-Bodied Honey Bees, Apis mellifera caucasica and A. m. carnica. Journal of the Kansas Entomological Society 54:697. Schmidt, J. (1995) Dispersal Distance and Direction of Reproductive European Honey Bee Swarms Journal of the Kansas Entomological Society 68:320. Though I’m not convinced they’re any less attractive either. This entry was posted in Beekeeping and tagged bait hive, swarms, Tom Seeley, Varroa on May 4, 2018 by David. For the past three weeks there has been zero interest in any of my five swarm traps in the garden (three hive apriary). This evening four of them had definite interest. A lot of comings and goings. I usually put only one bait hive per location with the intention of not ‘splitting the vote’ when the scouts try and persuade the swarm to relocate. I’ve no evidence that this increases the capture rate … certainly nothing that would stand up to statistical scrutiny. It’s a bit early for swarms here yet so mine are sitting there being ignored for the moment.